November 1, 2018 | Filed under: Current Articles,Featured | Posted by: Alex A. Individually, Scott Weiss and Erin Bradshaw are two powerhouses in the industry, each with an impressive resume including multiple World Champion titles. 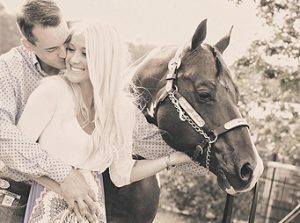 They were married in May of 2017, and, like many young couples, they’re navigating the life of newlyweds while juggling rigorous careers with the demands that only a life in the horse industry can bring. Erin has a successful corporate career in marketing for her mother’s law firm, KoonsFuller in Denton, Texas, while also promoting her father, NFL legend Terry Bradshaw, and his horses, as well as her husband’s growing business. Scott Weiss Show Horses in Aubrey, Texas, produces 10 to 15 foals each year and a select few are chosen to develop within his own program. He offers the others to lucky clients who know the level of care, expertise, and pedigree that went into the breeding and development of these worldclass horses. Horses from Scott’s program have achieved 17 APHA World titles, 6 APHA Reserve World titles, 2 NSBA World Championships, 1 NSBA Reserve World Championship, a Color BCF Reserve Championship, Congress Championships, Multiple PtHA World and Reserve World Championships, and Multiple NSBA Futurity Championships.